Heat a small amount of olive oil in a large nonstick pan over medium heat. Add carrots, and cook for 5 minutes, or until tender. Add rice, stirring occasionally, for 2 minutes. 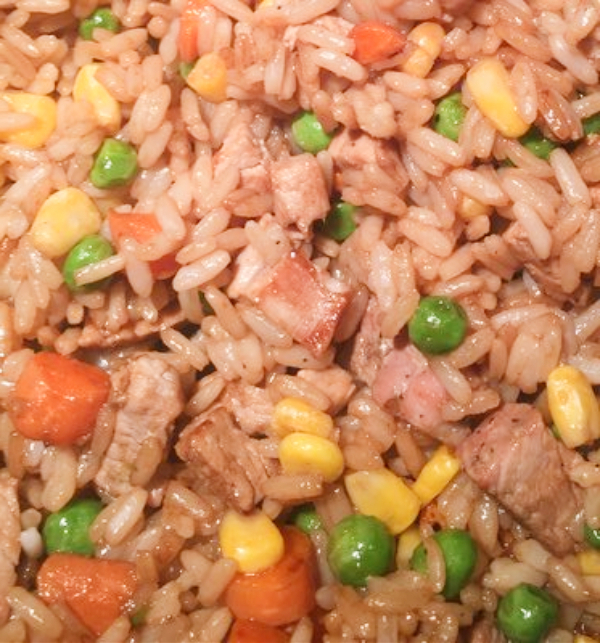 Add corn, peas, pork, soy sauce, sesame oil, and garlic powder, cooking and stirring for 2-3 minutes. I know it’s a common theme here, but I’m amazed at the differences in my world when I pull recipes from the archives. When I created this recipe a mere three and a half years ago, I had a child at home to consider when planning meals. Now, she’s wrapping up her junior year of college while I’m spending a week working in Saratoga Springs to see if this might be a good home base in the near future. However, summer break is only a month away, and then there may be a chance to make this recipe for her after each of us wraps up a day of work. To learn more about this recipe, originally published in November 2015, keep reading. Dinners at home have been a bit sketchy this fall. First, there are only three of us at home most of the time. Of course, we’ve been that way for over a year, so we’re used to that. Second, my husband has had an increase in travel, which means there are only two of us home for dinner. Third, cheer practice is in the evening, which means my daughter needs dinner before I’m typically ready to eat. With only two of us to cook for, I really haven’t been making big meals. I am quite content with a dinner of salad and flatbread. Understandably, this isn’t enough dinner for a 17 year old. So, some nights I make a dinner that is two-dimensional- grilled chicken and a veggie, plus some starch for the teen. Other nights, I plan a salad for me and a dinner that she likes, such as homemade chicken pot pie or mac and cheese. A few weeks ago I made a pork tenderloin as our dinner. Although it made more than the two of us would eat, I had a plan for the leftovers- fried rice. My daughter is a huge fan of rice, in almost all formats, so I figured this pork could be used to turn rice into an entrée. She absolutely adored the dish and the fact that I made enough for her to take leftovers to school for lunch. 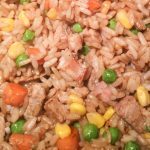 This fried rice has become a great standby meal to make. Not only is it quick to make, it also is easily modified. Have leftover chicken or shrimp? Use that instead of pork. Your family doesn’t like peas? Substitute with another veggie they prefer. For those with heartier appetites, this dish can be used as a side to accompany your favorite protein.